October 29, 2011 / 1 Comment on Scilly 2011: still there! Gareth Richards had four days off in half-term and we decided to revisit Scilly. Flew on the Skybus from Land’s End aerodrome at 10.40 on Monday 24th, found a B&B in Hugh Town, dumped our bags and set off to Lower Moors to try for the Northern Waterthrush which has been present since 16th September. But that plan was soon abandoned when we passed a couple of birders looking intently into a tiny bulb field behind Porth Mellon. “Got anything?” “We’ve seen a bird we can’t identify.” In other words, it could be mega. After about 20 minutes it showed again, very briefly in the shadows of the back hedge. Thrush Nightingale maybe? But as the crowd swelled there was talk of Veery, Hermit Thrush and even Rufous-tailed Robin. Over the next couple of hours, more and more people squeezed into the narrow viewing space, pressing me deeper and deeper into the hedge. Gareth and I both eventually saw it reasonably well and called it as a Common Nightingale. Only my second on Scilly but we’d all been hoping for something rarer, perhaps hoping too hard. The Northern Waterthrush was to prove a devious adversary but the Wilson’s Snipe that has eluded some this autumn could not have been more accommodating. On constant show with about 6 Common Snipe, it had a preen, showing off its diagnostic underwings and outer tail-feathers before flying towards the hide and walking up the bank to feed just a few feet from me, in company with a Common Snipe for convenient comparison. We did see the Waterthrush in the afternoon from the Shooter’s Pool screen, calling and showing for just a few seconds. Tickable but not very satisfactory and so we hung about till dark hoping in vain for a better view. The tedium of waiting was relieved by a vocal Yellow-browed Warbler and by a brief view and a few ‘tacks’ from a Dusky Warbler just after it was found by Spider. We spent the first and last hours of Tuesday waiting in vain at Shooter’s Pool for more views of the Waterthrush. In the middle of the day, we birded our way up to Borough Farm for superb views of the Upland Sandpiper. With that UTB, we were free to just bird and try to find some rarities of our own. Just a few fields away, Gareth found a Woodcock feeding out in the open in a bare field on Watermill Lane and we both had our best ever views of this species. On the coast path at the end of Green Lane, I picked up a dragonfly that fluttered weakly at my feet as I walked past: male Red-veined Darter Sympetrum fonscolombii! Further up Green Lane, a small crowd was watching a Hawfinch making a right mess of eating haws. Male Red-veined Darter. A fully mature individual should have more extensive red on the abdomen. Neither of us could face another dawn at Shooter’s Pool so we were birding Porthcressa Beach when we heard that the Waterthrush was showing on Higgo’s Pool. We missed it by three minutes, gave it another 40 and then just as Gareth gave up and set off … ‘zik!’ and there it was! It made up for its previously elusive behaviour by giving us (me, Gareth and Tony Davison) absolutely stonking views just a few metres away. After 20 minutes or so, it flew off and we punched the air! YES!!! The Northern Waterthrush. I've always been a sucker for a zonking great supercilium. We had the rest of the day to head out and find rarities, splitting up to cover different parts of the north of St Mary’s. In the first 24 hours of our stay on Scilly, other people had found 2 Olive-backed Pipits, Little Bunting, 2 Dusky Warblers, Pallas’s Warbler, Radde’s Warbler and White-rumped Sandpiper. Unfortunately Wednesday was a quiet day (the best find of the day was a Bluethroat on St Agnes) and we found little of note. But birding on Scilly, even without seeing anything rare, is a pleasure. And I did end the day with some excitement after a passing birder tipped me off that the Treecreeper was showing again in Carreg Dhu garden – I ran for it! My third Scilly tick of the trip (with Waterthrush and Dusky Warbler). Thursday. Dawn on Peninnis Head with a few migrants on the move overhead including a Redpoll and a Lapland Bunting amongst others. Bizarrely, as I’ve noticed before, the vismig on Scilly seems to be of birds coming in from the west and heading back east. Perhaps at first light they realise that they’ve gone off course and turn back towards land? A fleeting view of a bird flitting out of a weedy field got both of us excited. It was ultra-wary and after chasing it through several fields it gave itself up – as just a Skylark. Faulty rare-dar! Yesterday’s Bufflehead was still present at Housel Bay on the Lizard and we reckoned our 16.35 flight back to Land’s End would give us at least half an hour of daylight on the bird. In fact, everything went really smoothly and we spent over an hour watching the Bufflehead on a tiny pool. Perhaps the best candidate for a genuine transatlantic vagrant Bufflehead that we’ve had in Britain? Bufflehead. It was gone by the following morning. Scilly 1985: I was there! October 19, 2011 / 9 Comments on Scilly 1985: I was there! 26 years ago, half-term, Saturday 19th October 1985, I got off the ferry on my first visit to the Isles of Scilly, aged 16, with three school-friends. We walked straight up to the Garrison camp site. While I was pitching our tent and Gareth Richards was checking in and paying, a birder with a resplendent beard walked up to me and asked “Can I interest you in a Booted Warbler?”. He’d just found it and within a minute I was onto it – the first tick of the trip! Gareth never did see it but we couldn’t give it long as we had bigger fish to fry that day. First stop was a Yellow-billed Cuckoo giving awesome views from the Garrison Walls looking down into a Sallyport garden where it was perched on a rotary washing-line! Then to the Incinerator to watch a male Rose-breasted Grosbeak scoffing blackberries. Moving quickly on to Old Town churchyard for UTV of a Red-eyed Vireo in the high elm canopy. Across the road to the school for fabulous views of a Myrtle Warbler (as it was then; Yellow-rumped Warbler now) creeping around on lichen-covered elm boughs. Up to the airport for an unbelievably showy Bobolink crawling around in the grass at point blank range. Final rarity of the day was a juv Night Heron roosting in sallows on Lower Moors. But I had one more tick to come – Brambling! My first 'scope: an Opticron Piccolo, purchased after 6 months on a paper round. On Sunday we took the boat to Tresco for another deluge of ticks: a Radde’s Warbler in the Great Pool sallows which is still the best one I’ve ever seen; Spotted Sandpiper, Ring-necked Duck and Richard’s Pipit all at the Simpson’s Field end of Great Pool, and then a Woodchat Shrike in some big pines and a stunning Bee-eater at Borough Farm (later to become my favourite place on Scilly!). Back on St. Mary’s I saw my first Jack Snipe and Lapland Bunting, got better, but still untickable, views of the REV and then yomped to Newford Duck Pond for a Pallas’s Warbler in failing light, my 9th tick of the day! We had gone for quantity over quality on Sunday by going to Tresco, hoping the best of the lot would stick on St. Agnes for another day. And it did … we yomped straight from the quay to see a male Parula Warbler showing beautifully in a couple of apple trees two fields up from the chapel. To this day, one of the best birds I have ever seen in my life. An American Wigeon on Big Pool was yet another new yank for me. And back on St. Mary’s we re-located a Wryneck on Peninnis Head – another stunning new bird. We had a day to catch our breath on 22nd and then a male Sardinian Warbler turned up at Higher Moors. It gave us a long wait but in the meantime we were there when Chris Heard called an Olivaceous Warbler at Lunnon Farm on 23rd. We eventually saw the Sard well on 24th and had time to cross over to Bryher for a Rose-coloured Starling. Attempts to see the bird were abandoned after a hostile islander dispersed the twitchers by firing his shotgun. To this day, landing on Bryher gives me a feeling of trepidation. We sailed back to the mainland the following day, leaning on the Scillonian’s railings chatting to the late, great Peter Grant about bird ID. The cost of the entire trip including tubes, trains, ferries, camping, inter-island boats and a week’s worth of Kavorna pasties was £80. I’ve been back to the magic isles many times since but 1985 can never be bettered – I’m so glad I was there! Tony Allen discovered this hydrophilid beetle new to Britain from a silage clamp at Wimborne St. Giles, Dorset in 2003. It didn’t persist in Dorset but next turned up in Colin Welch’s plastic compost bins in his garden at Hemington, Northamptonshire on 2nd October 2005 where it persisted for several years but hasn’t been seen since Colin used his compost in 2010. Tony had kindly given me one of his specimens so I knew what it looked like and had hoped I might find it in our compost bins one day. So when I lifted the lid on Wednesday 12th October and saw the back end of a hydrophilid heading down into the goo, I had no hesitation in thrusting my hand in to catch it! And Dactylosternum abdominale it was! I soon learnt of two other recent records. Martin Collier and Andrew Duff found it in a rotten hollow poplar log in a plantation near Mundford, West Norfolk, on 29th September, and James McGill found half a dozen on a well-rotted bracket fungus in Swell Wood, South Somerset on 2nd October. It sounds like it is getting established this year, especially as it is being found in more natural microhabitats. I have since found more in my compost bin. Hawthorn Jewel Beetle. One of Philip Harwood's specimens photographed at Oxford University Museum of Natural History. I have never actually seen a live Hawthorn Jewel Beetle Agrilus sinuatus though I have recorded the species on a dozen occasions. 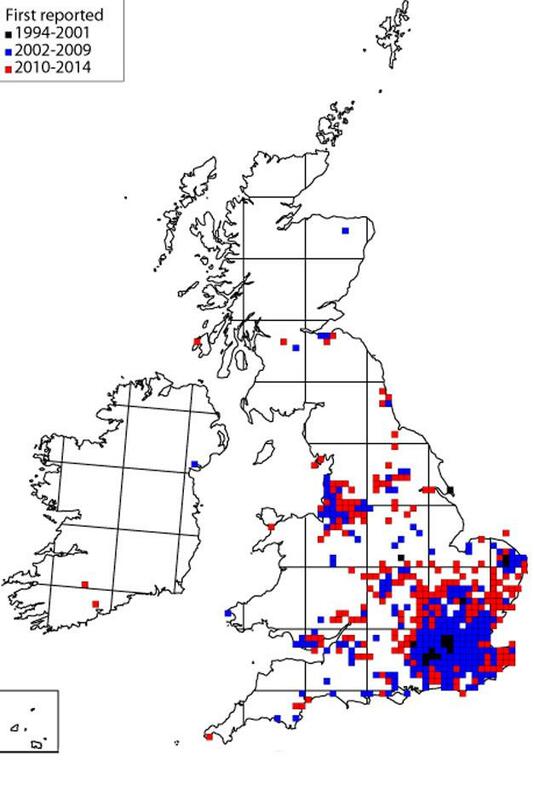 It can be found over a wide area of southern England (map here) by looking at mature hawthorns where the D-shaped exit-holes are a tell-tale sign. The D-shape matches the cross-section of the adult jewel beetle: flattened on top and convex below. The holes are best looked for on lower branches that are dying back but can also be found on the trunk and major boughs. D-shaped exit hole characteristic of Agrilus. To be extra sure you have found Agrilus sinuatus exit-holes, you can whittle away the bark to reveal the vacated larval borings which seem to always have quite a regular snaky, zig-zag pattern. The larval borings are also illustrated in a note by Keith Alexander (1990) who pioneered the recording of jewel beetles in this way: available online here. I would like to think that the ‘sinuatus’ of the name (given by Olivier in 1790) refers to the sinuate pattern of the larval borings. Snaky borings of Agrilus sinuatus in a hawthorn branch. Finding adults in the field must require some luck. They may be very short-lived, they may spend their lives out of reach around the crowns of hawthorns, or they may be too flighty to simply tap them out onto a beating tray. Agrilus sinuatus was regarded as ‘very rare’ by Fowler in 1890, as Vulnerable (RDB2) in 1987, and was downgraded to Nationally Scarce (Na) in 1992 and although still officially Na today we can probably safely call it common, largely thanks to a better understanding of how to spot the signs. The best way to see adults would presumably be to rear them out of a suitable hawthorn branch. Under natural conditions, adults are active from mid-June to late September so collecting a branch any time up to mid-June ought to do it. The trick would be to find a branch that doesn’t yet have any D-shaped holes in it but looks like it will do soon! Alexander, K.N.A. (1990). Agrilus sinuatus (Olivier) (Coleoptera: Buprestidae) widespread in Gloucestershire, and at a Herefordshire locality. British journal of entomology and natural history, 3: 31 – 32. [Browse this article online here]. When we moved into this house and planted up the garden with insect-friendly plants, we put in loads of Lavender and Rosemary, hoping one day to attract the Rosemary Leaf-beetle Chrysolina americana. Today I saw the first one in the garden … on Lemon Balm! This is an alien beetle which despite the ‘americana‘ name is a native of southern Europe. It is such a looker that I am happy to welcome it in, in any case it has now become well established since it was first recorded in Britain (at RHS Wisley in 1994): see map here. It is best to look for it on Rosemary and Lavender but it can also breed on Thyme and Sage. See the Royal Horticultural Society’s Rosemary Beetle Survey webpage for more info and to submit sightings. The only similar beetle in Britain is the very rare Rainbow Leaf-beetle Chrysolina cerealis which feeds on thyme on the slopes of Snowdon and in Cwm Idwal. I have been up and looked for it but without success. I hope to see it one day but meanwhile it is great to have americana in the garden.